Cover design by Corinne Troisi & Stéphane Berland. 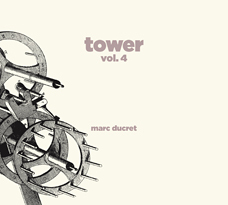 "Playing the music of «Tower » on my own, having previously performed it with a quartet (see volume 2), a quintet (see volume 1) or a sextet (see volume 3), is a way to bring out certain aspects of the compositions, certain possibilities for development that are distinct from working with a group. Solo improvisation allows faster decisions, and the building of « bridges » between pieces; it is also an opportunity to re-assemble parts of different pieces in a totally different order, offering a new vision of the same music.."